One thing becomes clear to all around Tommy - including his family, that he is a bit of a sad sack loser. A leech that expects everything but is unwilling to do the work required for a person to change their life situation. Unable to really get over his previous relationship or find work, he ends up taking over his recently deceased Uncle’s Ice-Cream truck, causing more trouble than it’s worth involving the seventeen-year-old niece of his former girlfriend. Made in 1996, Trees Lounge reminds you of what a real independent film feels like. In recent years, the line seems to have become blurred in the mainstream as too who or what exactly constitutes such a thing. However, this film is the debut work of a true artist in writer/director/star Buscemi. Made for less than two million dollars, the film’s confronting reality of the almost pointlessness of life at times, alongside an ensemble of great performances from the likes of Junior, Chloe Sevigny, Elizabeth Bracco and Daniel Baldwin give the film a real spirit and ironic humour. 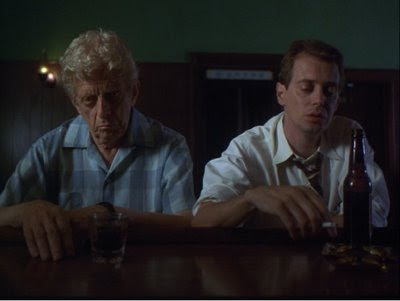 Buscemi himself, as the central Tommy, plays out a meditation in all things loserdom excellently. Bad choices, selfishness, alienation, you name it; Tommy justifies such a label to himself and to all around him. Coupled with all that happens up until the poignant, almost depressing ending, it is difficult to sympathise with or for him. Not that Buscemi as writer/director expects or even wants us too. The laidback, but hardly laconic script slowly draws out circumstance in a very observatory way avoiding influencing the audience too much about how we should feel about these people. We can only gauge their actions, not really react. The lesson then is that life is what you make it - and sitting around in a dive bar all day will not help your cause. Tommy, and many like him, are destructive people to all who are close, never fully realising until it is too late. In short, and incorporating a great soundtrack to boot, Trees Lounge is a deeply humorous, albeit bleak slice of life that, if you let it, can help put your own into perspective too.